1791 April. Born at Buxton, Coltishall, Norfolk, the second son of Jonathan Cubitt (1760–1807), a carpenter, and his wife, Agnes Scarlett. He had three brothers, including Thomas Cubitt, building contractor, and Lewis Cubitt, an architect, and two sisters. The family moved to London shortly after William's birth. Served four years in the Navy. 1810 Joined his brother Thomas as a carpenter. 1814 Married Elizabeth Scarlett ( -1854) and they had a son and four daughters. 1815 Thomas and William won an important contract for the London Institution and took land for building works and development in the Gray's Inn Road to build their works. There followed extensive contracts for development, including leases on the Bedford estate in Bloomsbury, and the Grosvenor estates in Westminster. By 1824 William was in partnership with two of his brothers as "Messrs. T. W. and L. Cubitt", though this was dissolved in 1827. 1827 The business was divided between the brothers, William keeping the Gray's Inn Road works, and the contracting side of the business, while Thomas continued the developments on the Grosvenor estates and elsewhere. 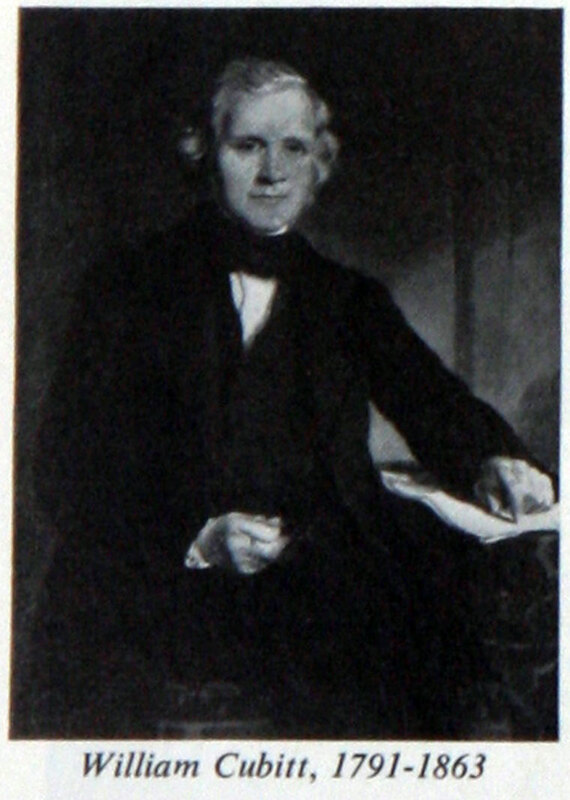 The youngest brother, Lewis, joined first Thomas and then William, before making an independent career as an architect. W. Cubitt and Co was one of the best known of London contractors, responsible for many important buildings. William was also interested in development, taking an extensive area on the Isle of Dogs, then being developed, which became known as 'Cubitt Town', and was developed with industrial and commercial buildings on the riverside. Involved with the West London Railway Company. Chairman of the Royal Commission for the Thames Embankment. 1833 William Cubitt of Gray's Inn Lane, a builder and contractor for public works, became a member of the Institution of Civil Engineers. 1851 Withdrew from the contracting business. 1860 Lord Mayor of London, and re-elected for a second term. Prime mover in plans to commemorate Prince Albert. 1863 died at Penton Lodge, Andover, on 28 October 1863. Cubitt's name lives on in the area known as Cubitt Town, the south-eastern part of the Isle of Dogs. This was developed in the mid-nineteenth century. William Cubitt embanked the river-front, enabling drainage of this low-lying land, and laid out the principal streets during the 1840s and 1850s..
MR. ALDEHMAN WILLIAM CUBITT, M.P., who was born in the year 1791, began life in the Royal Navy, but he soon abandoned the sea and joined his brother, the late Mr. Thomas Cubitt (Assoc. Inst. C.E. ), as a builder, and for many years he carried on a very successful business in Gray’s Inn Road, covering large tracts of land, in the north-west of the metropolis, with fine houses, and also executing some extensive railway contracts, amassing a large fortune, which he used in a most praiseworthy manner. At an early period he became interested in City affairs, and in 1847 he served the office of Sheriff of London and Middlesex. In the same year he was elected the representative in Parliament of the borough of Andover, of which place he continued to be the sitting Member until the period of his decease, with the exception of a short interval in 1861-62. On the decease of Sir John Key, in 1851, he was elected Alderman of the Ward of Langbourne, and in 1861 he was elected Lord Mayor of the City of London, the duties of which post he performed with so much uprightness, intelligence, and hospitality, that he was re-elected for the year 1862. During this double tenure of office he commanded in an extraordinary degree the respect and confidence of the Court of Common Council and of the citizens generally, and he was enabled, by his munificent example, to raise larger sums of money, as contributions to public charities, than had ever been previously subscribed. He took a very prominent part in originating the public subscription towards the erection of a memorial to the late Prince Consort, and was, by Her Majesty, nominated to serve upon the Committee for assisting in the decision of the form of the Memorial. Mr. Cubitt was also President of St. Bartholomew’s Hospital, Prime Warden of the Fishmongers’ Company, and a magistrate for Middlesex and Surrey. He was elected an Associate of the Institution of Civil Engineers January 22nd, 1833; served on the Council for the Session 1842-43; contributed, in 1840, an original communication to the Society, 'On a new mode of covering Roofs with Planking,' which was published in the Minutes of Proceedings, and was a frequent attendant at the Meetings, taking much interest in the proceedings and welfare of the Society. He was essentially the architect of his own fortune, rising to distinction and a very honourable position entirely by his own exertions. He was justly popular, and was highly esteemed for his good sense, probity, and suavity of manner, and his decease, which occurred on the 28th of October, 1863, at his seat, Panton Lodge, Andover, in his seventy-third year, was a source of deep regret to his family and to a large circle of attached friends. This page was last edited on 2 December 2013, at 16:43.